Hair was set in perfect waves, the corseted bosoms were heaving and the lashes were dialled up to 100. And that was just the audience. “Decadence and Debauchery” staged by local Canberra burlesque performer Jazida, was a super-relaxed and interactive affair, where the audience was encouraged to participate vocally and appreciatively in any way other than photography, as the pretty, dimple-cheeked hostess Charlie Chapstick gently but firmly reminded us. 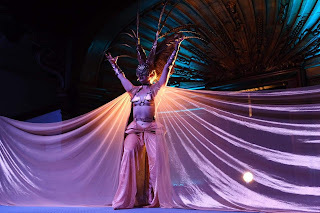 The costumes throughout the production were spectacular, in particular Alyssa Kitt’s Icarus (fallen woman), which she performed in rose gold skirts, sculptural pieces and a stunning, beautiful headpiece. The routine was arguably the most sexually raw of the evening and her appearance and routine were captivating. Kitt returned later in the show, billed as one who “eats the hearts of Hillbillies” and performed an energetic, entertaining routine to George Thorogood’s “Bad to the Bone”. Alyssa Kitt as Icarus. Image supplied by CaptaVitae. Curvy performer Ginger Foxx performed in a striking black and gold dress, beautiful sheer black and gold skirt, and a dramatic headpiece that cleverly doubled as her fans. Her earlier dance in soft grey outfit with huge, grey, feather fans was inspired by the Hollywood Golden Era. Milky skin, red wavy hair and 50’s makeup completed her look beautifully. Jazida, with her exotic looks and pint-sized, albeit womanly physique, remained alluring as she threw herself into the splits and threw off her attire. Her soundtrack had been composed especially for her routine. She also performed with the fan dancers, presumably students of Jazida. Although these numbers didn’t fit the billing of professional performers, it broke up the individual acts with an ensemble piece and gave these dancers some exposure (so to speak) in an encouraging and laid-back atmosphere, allowing them to perform with confidence and expression. There is a long list of accolades accumulated between the individual performers, including for Maple Rose who impressively stitched her own intricate costume, surely inspired by Mae West. And for the trailblazing burlesque dancer Elizabeth Burton, who, in her 70s, still put on a precise, fun routine, retaining the qualities of flirtation, poise and faux demureness she surely possessed many years ago. Burton passed on her knowledge and experience in a series of workshops held over the weekend. In case anyone thought the evening was going to be a confronting or serious affair, their concerns were allayed with the entrance of T(ease)-Rex, entailing a blow-up dinosaur costume, complete with fans in its little T-Rex arms. It shouldn’t have been as amusing as it was, but the audience was in stitches. When drop sheets were laid down, the mind boggled as to what might be coming next, before a couple launched into a routine inspired by the infamous pottery wheel scene from Ghost. A g-string clad male trying to get out of skinny jeans is always going to be amusing, but “ghosting” someone has never been “cheekier”. There was no program provided and the clarity of the sound system was rather poor. The stage itself at The Abbey is lovely but the lighting was haphazard on cues and the balance between house and stage lights was tricky. Unfortunately, the wait on drinks (in a room without very effective fans) was exponentially lengthy. Some chatting by the hostess allowed her stagehand to gather the items of discarded clothing strewn around the stage (and a fellow reviewer’s lap) in between numbers, but the wrap-up and conclusion of the show needed to be tighter. From dancing dinosaurs to feathered fannies, a rocking soundtrack to clay-flinging routines with no scope for second takes, this was a fun and accessible night of entertainment.